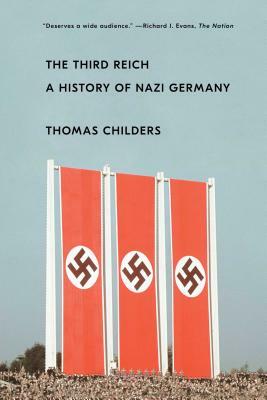 “Riveting…An elegantly composed study, important and even timely” (Kirkus Reviews, starred review) history of the Third Reich—how Adolf Hitler and a core group of Nazis rose from obscurity to power and plunged the world into World War II. In “the new definitive volume on the subject” (Houston Press), Thomas Childers shows how the young Hitler became passionately political and anti-Semitic as he lived on the margins of society. Fueled by outrage at the punitive terms imposed on Germany by the Versailles Treaty, he found his voice and drew a loyal following. As his views developed, Hitler attracted like-minded colleagues who formed the nucleus of the nascent Nazi party. Between 1924 and 1929, Hitler and his party languished in obscurity on the radical fringes of German politics, but the onset of the Great Depression gave them the opportunity to move into the mainstream. Hitler blamed Germany’s misery on the victorious allies, the Marxists, the Jews, and big business—and the political parties that represented them. By 1932 the Nazis had become the largest political party in Germany, and within six months they transformed a dysfunctional democracy into a totalitarian state and began the inexorable march to World War II and the Holocaust. It is these fraught times that Childers brings to life: the Nazis’ unlikely rise and how they consolidated their power once they achieved it. Based in part on German documents seldom used by previous historians, The Third Reich is a “powerful…reminder of what happens when power goes unchecked” (San Francisco Book Review). This is the most comprehensive and readable one-volume history of Nazi Germany since the classic The Rise and Fall of the Third Reich. Thomas Childers was formerly the Sheldon and Lucy Hackney Professor of History at the University of Pennsylvania and the recipient of numerous fellowships and awards. Childers has held visiting professorships at Trinity Hall College, Cambridge, Smith College, and Swarthmore College, and he has lectured in London, Oxford, Berlin, Munich, and other universities in the United States and Europe. He is the author or editor of several books about modern German history and the Second World War. "Riveting. . . . An elegantly composed study, important and even timely, given current trends in American and global politics." "An exhaustive but powerful timeline of the rise and fall of the Third Reich. Childers dispels some common misconceptions about early Nazi history, while not sugarcoating their heinous atrocities. This book is a historical reminder of what happens when power goes unchecked." "The new definitive volume on the subject, supplanting William Shirer’s gold standard The Rise and Fall of the Third Reich. . . . The book’s main strength lies in its chapters on the rise and early years of the party. And with newly unearthed documents – many from Germany – that the author had access to."